Black 1 comes in handy when 7 gives atari and threatens to make two eyes. 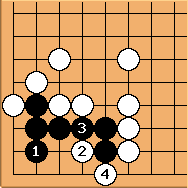 If White connects at 3, Black captures at a and has an eye in the corner and one where he captured four stones. 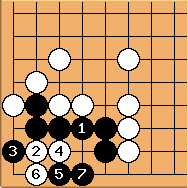 White 2 takes a vital point, and 4 and 6 reduce the eyespace but still a and b are miai for life. 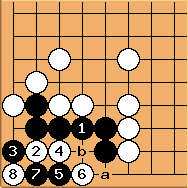 Black 1 creates a long L group, which White can turn either into seki or (worse) into ten thousand year ko, depending on Black 5. 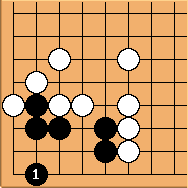 Life with points as in the correct diagram is better than seki (or ten thousand year ko). 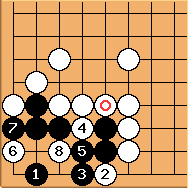 If White resists at 6, Black 7 is a tesuji. Black 9 recaptures at 7 and if White connects underneath at a, Black can give atari at b. 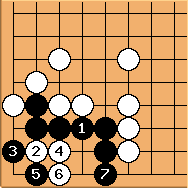 Here Black misses the tesuji and ends up with a ten thousand year ko. Black 1 is badly placed for catching the placement stone 2. If the marked stone is present Black 1 doesn't work anymore. White 8 is double atari. In this case it is better to create a long L group with 1. 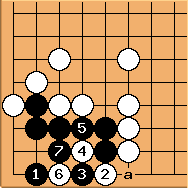 The marked stone now alters the status from seki to ten thousand year ko. See Long L Group for details.